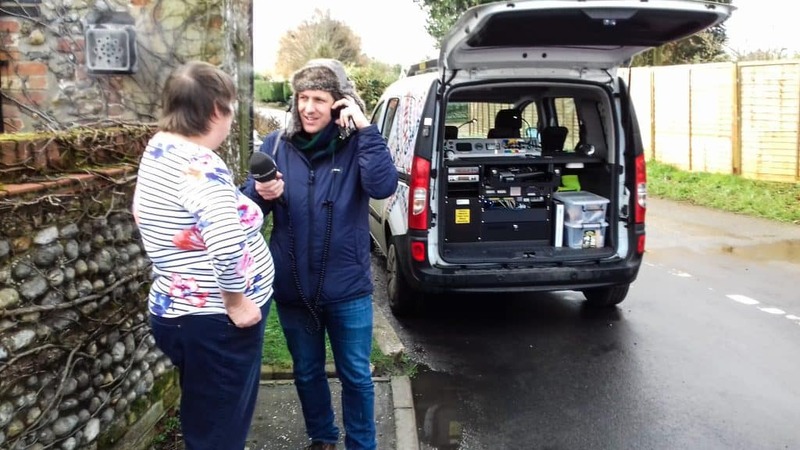 We have had many interesting visitors in our time at The Old Bakery and today we hosted one more, BBC presenter David Whiteley came looking for a clue in Radio Norfolk’s Treasure Quest. A quilt made by Alison was fundamental to the hunt. For the uninformed Treasure Quest is our local radio’s take on the old TV series Treasure Hunt. Broadcast live every Sunday morning a presenter & driver follow cryptic clues cracked by the audience around Norfolk until they find the treasure, all in a deadline of 3 hours. Run for 10 years it now has something of a cult following including a follow up ‘extra’ program afterwards. Mike had been interviewed by Paul the producer when we had won The UK’s Friendliest B&B of the year award and he approached us to be one of their venues for a clue today which of course we willingly agreed to. He asked that we hid the clue within one of Alison’s patchwork quilts and so we pinned it to the quilt that Alison had just completed for our newly renovated and refreshed Baker’s room. After leaving a few ‘red herring’ quilts downstairs David had a little search before finally finding it. 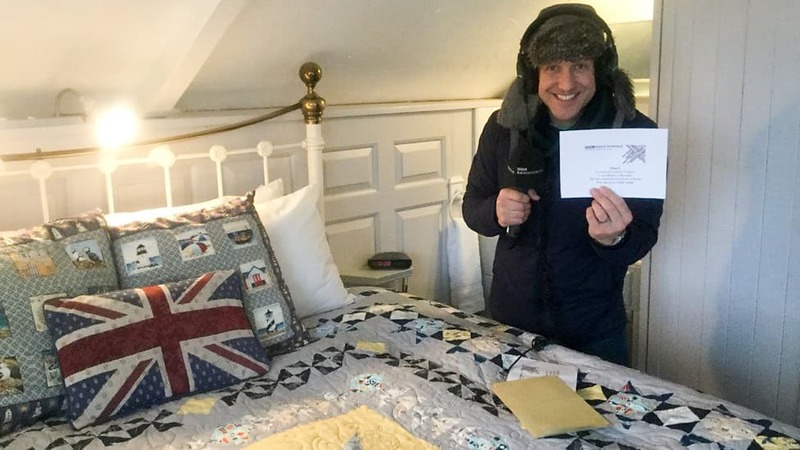 BBC David Whiteley finding the Clue pinned to a quilt in one of the B&B rooms here at The Old Bakery B&B. After a short interview with Alison and armed with some of our homemade Lemon Drizzle cake off they went in hunt for the next clue. To hear the initial clue that sends them here click on this link and start listening from 17mins 36secs ~ 23mins 33secs. Then 28m 10secs ~ 32m 52s for more about the clue. Then 34m 30s ~ 40m 20s For their arrival and finding the clue. Then 43m 00s ~ 44m 23s For Alison’s short interview. BBC Presenter David Whiteley interviewing Alison about the B&B and quilts. A couple of hours later Alison did a follow up live interview with more detail about our village craft association CIA (Crafts In Action) and her patchwork quilting. The patchwork quilt retreats are now a very big part of our business and despite practically no advertising we have built up an ever growing amount of retreats through word of mouth and our prominence on Google search engine. To this end we have decided to re-invest in the business and build a large purpose built pine log cabin studio in our garden. To date we have had to use the dining room which has an obvious inconvenience at meal times especially as we provide all meals throughout the day. The Studio will be designed specifically with quilt retreats in mind. We have a corner of the garden which is under used and this is where it will be tucked away. 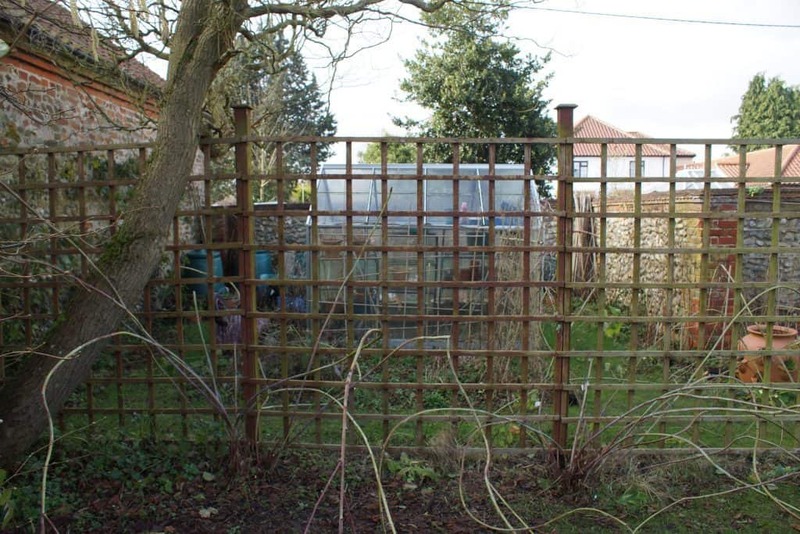 So far the only prep work that we have accomplished is to untangle next season’s Loganberry runners from the trellis work as they along with the green house need to be re-positioned. We intend to have the studio set up and fully running by the end of March, we just love putting ourselves under pressure! Nothing to see here yet but watch this space! Preparing the site of the forthcoming new quilt room studio.